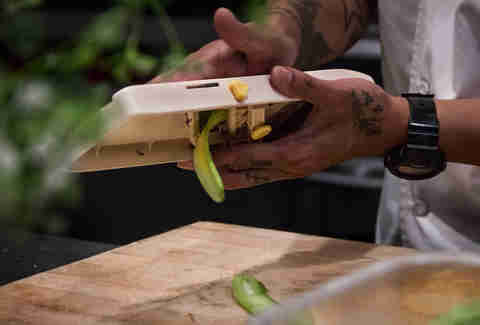 In our fast-growing food culture, it’s become evident that more and more San Diegans are valuing freshness, sustainability, and a connection to their food. From ceviche to our famous fish tacos, seafood is a staple in our local cuisine, and the only fish in SD fresher than the ones at Tuna Harbor Dockside Market are still in the ocean. The THDM is more than just a market, though: it's dedicated to educating the public about commercial fishing and responsible, sustainable fishing practices. Its website is a treasure trove of information, including what species each fisherman specializes in, the names of their boats, their number of years of experience, and the fishing methods they use. 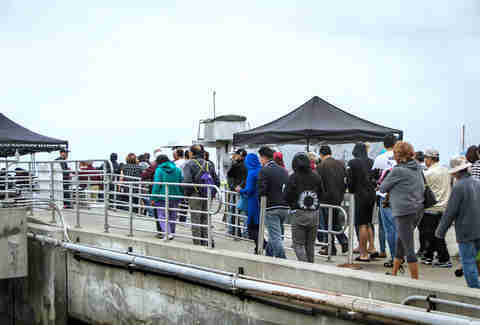 Every Saturday from 8am-1pm, the fishermen of San Diego set up shop on Fish Harbor Pier in Seaport Village with everything under the sea, from shellfish to sharks. 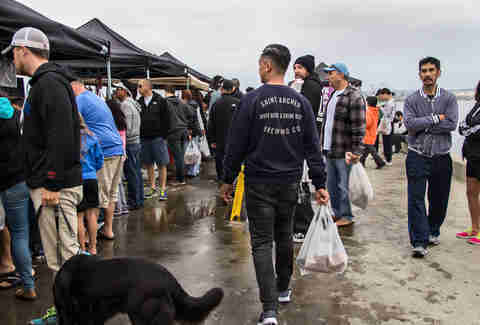 While you’re still in bed sleeping off your Friday night, chefs and dedicated civilians line up before the market opens to make sure they get the first picks. 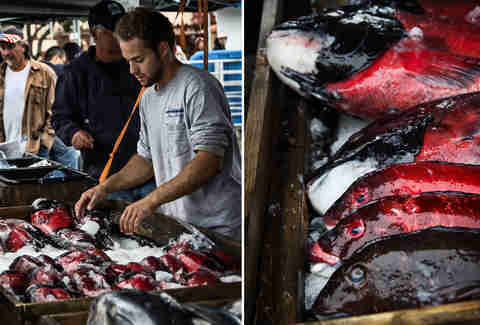 Everything available at the market is sustainably caught in the waters around San Diego (you may think twice about swimming in the ocean after you get a closer look at the teeth on a few of these fish). 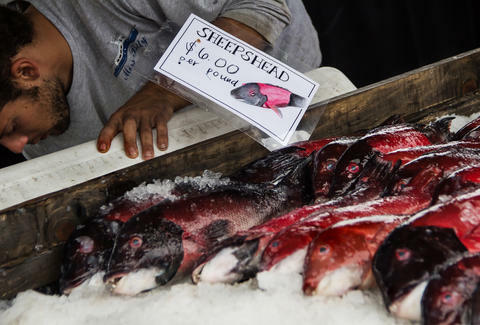 While some catches like yellowfin tuna and sea urchin are available year-round, others like these California sheephead are only found seasonally. 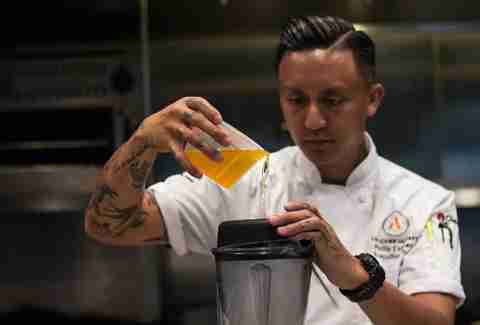 Early one rainy Saturday morning, we met up with Phillip Esteban, executive chef at The Cork & Craft in Rancho Bernardo, to explore the market and follow the journey of one fish from the dock to the dinner plate. After cruising around the market to vet the day’s selection, Chef Esteban chose a California sheephead from fisherman David Haworth. 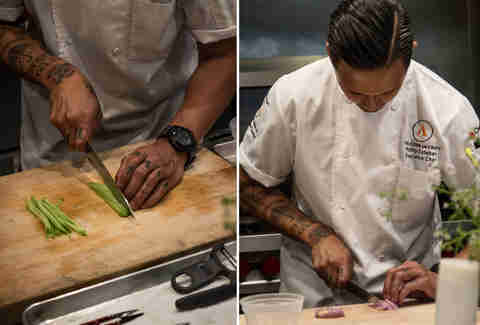 He’d never prepared this type of fish before, but the opportunity to experiment with a new product and explore new flavors is one of the best things about the market. If you’re curious about a fish you’ve never seen before, the vendors and fishermen hanging around are more than happy to answer your questions. 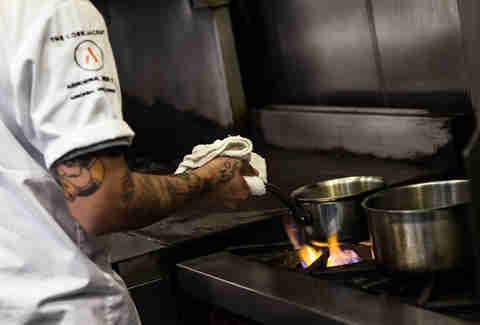 They can also give advice on the best ways to prepare the fish they sell; the THDM recommends recipes you can try, too. On our way to the restaurant, Chef Esteban picked up some seasonal green almonds, Persian cucumbers, and locally foraged coriander blossoms at the Specialty Produce farmers market, a local vendor that provides fresh produce to many restaurants and is open to the public. 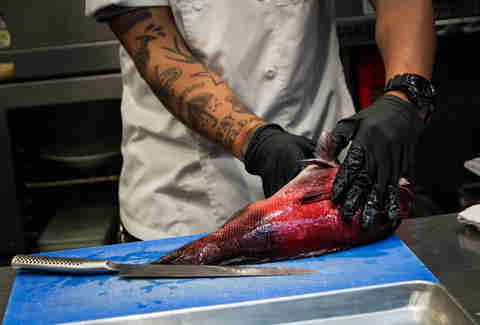 Back at The Cork & Craft, Chef Esteban expertly cleaned and deboned his sheephead before it was sous vide with olive oil, but you can save yourself the hassle (not to mention fishy smelling hands) and have your fish cleaned for free at the market by its on-site butcher. To prep the green almonds, he removed the fuzzy outer hull to get to the soft, immature nut on the inside. 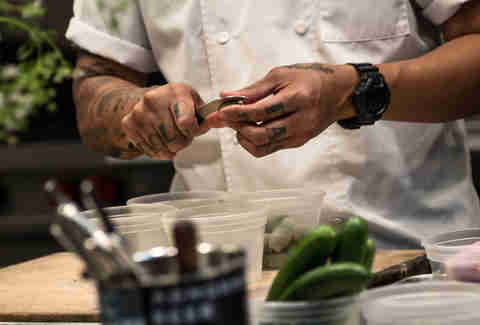 He minced cucumbers and shallots to make a relish with dill oil, sherry vinegar, salt, and black pepper. The mixture was then cryovaced to make a quick pickle. 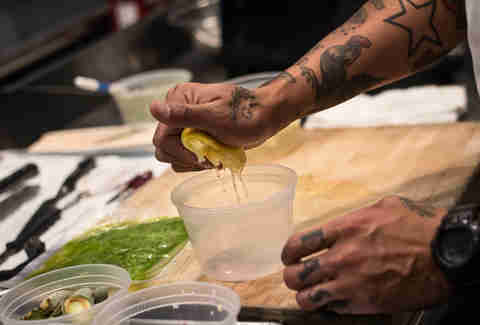 Fresh lemon juice was used to add freshness and brighten up the flavors of the dish. ... then emulsified it into a butter cream sauce. 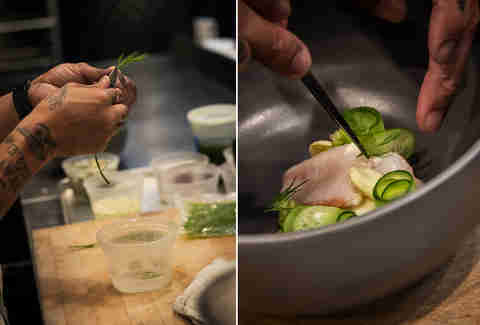 Using a mandolin, Chef Esteban shaved the Persian cucumber into paper-thin ribbons. 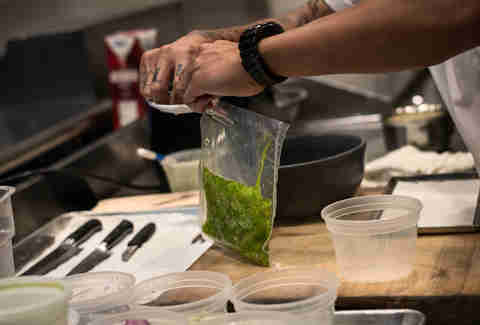 ... and the fish was dusted with dehydrated dill. 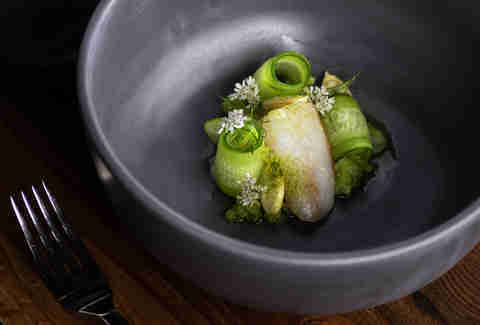 The result is a locally sourced and beautifully plated olive oil sous vide sheephead with green almonds, coriander blossoms, cucumber relish, dill, and butter cream. Sara Norris is a freelance photographer and writer who loves swimming with the fish as much as she loves eating them. Follow her foodie adventures: @saraknorris.